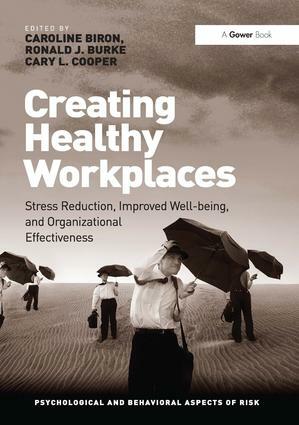 The contributions in Creating Healthy Workplaces include a number of interventions that relate the efforts undertaken by researchers and organizations together, to reduce stress and improve the mental and physical health of employees through positive change initiatives. Those working in the field of occupational stress have received criticism that too much emphasis has been placed on negative issues and that positive initiatives have been largely ignored. With the growing influence of the positive movement, this book explores the implications of using a positive approach as opposed to a stress management one and compares the types of interventions they each require. From a positive perspective, there is a need to understand the characteristics of healthy, thriving, and flourishing people and organizations. This book explores the implications of using a positive approach as opposed to a stress management one. Some of the interventions described in Creating Healthy Workplaces target individuals and their attitudes and behaviours, others target workplace relationships, work units and the wider organization. Outcomes such as reduced occurrences of smoking, obesity, depression, elevated blood pressure, accidents and workplace injuries, presenteeism, absence and staff turnover are reported. The factors associated with the success of these interventions are identified and advice is given as to how interested individuals and organizations might proceed to develop worksite interventions on their own. Caroline Biron, PhD, assistant professor in management at Laval University, Quebec, Canada, received the Best Intervention Award at the 2011 Work, Stress, and Health Conference (APA-NIOSH-SOHP). Her work on the implementation of organizational interventions has been extensively published in both practitioner’s guidelines, and scholarly articles and books. Professor Ronald J. Burke, one of Canada's most prolific researchers, focuses on the relationship between the work environment and individual and organizational health. He was Founding Editor of the Canadian Journal of Administrative Sciences and is widely published. He has participated in over 300 management development programs and consulted on organizational effectiveness issues for private and public sector organizations. Cary L. Cooper, CBE, Distinguished Professor of Organizational Psychology and Health, Lancaster University Management School, England, is author of over 100 books and 400 scholarly articles, and a frequent contributor to national newspapers, TV and radio. He is Founding Editor of the Journal of Organizational Behavior and Editor in Chief of the medical journal Stress & Health. Risk management is an ongoing concern for modern organizations in terms of their finance, their people, their assets, their projects and their reputation. The majority of the processes and systems adopted are either very financially oriented or fundamentally mechanistic; often better suited to codifying and recording risk, rather than understanding and working with it. Risk is fundamentally a human construct; how we perceive and manage it is dictated by our attitude, behaviour and the environment or culture within which we work. Organizations that seek to mitigate, manage, transfer or exploit risk need to understand the psychological factors that dictates the response and behaviours of their employees, their high-flyers, their customers and their stakeholders. This series, edited by two of the most influential writers and researchers on organizational behaviour and human psychology explores the psychological and behavioural aspects of risk; the factors that: * define our attitudes and response to risk: * are important in understanding and managing 'risk managers' * dictate risky behaviour in individuals at all levels.